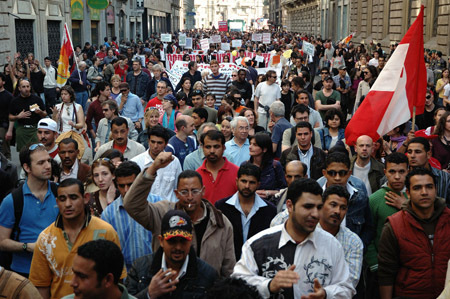 05.May.08 - It is great to be 80.000 people, migrant and precarious workers, together in Milan for EuroMayDay008. From Piazza XXIV Maggio to Piazza Castello, 30 floats crossed the streets, from 3 to 8 pm, loud music, average age: less than 30 years old. Under a hot sun in a clean sky, notwithstanding the bad weather predictions and those who do not love us. From Turin to Bologna, from Vicenza to Brescia, from Piacenza to Feltre, from Bergamo and all Lombardia. The migrant's float opens the parade, in the hands of a San Precario with a kefiah on his head. The banners say: No borders, no precariety, freedom of movement! It is great to be 80.000 people who share this demands. A permanent legalization, an end to the link between labor contract and the residence permit, closure of all detention centers: it is not only a migrant's matter. These demands speak about the precarization of work and life, therefore they speak about all those who invaded the streets of Milan. Drums blast while men and women from different countries bring a new icon, the growing "patchwork" banner of the transnational chain of migration related action, every piece sewed up with every other, corresponding to a new station: now it is here, EuroMayDay 008. Just behind, the float of precarious women who want to "give birth" to their rights, dancing their rage in a cage, the cage of precarity that has to be burst. Then, the working groups of Intelligence Precaria march: the call center workers, social operators, the cashiers of the Esselunga supermarket, the self-organized of the Scala theatre, the bus of self-productions, the freelance journalists on the float of City of Goods, the precarious free press. Then social centers and social unionism: Cobas, Cub, Sdl, Slai cobas. This is not a feast only for those who march, it is a feast of all the city, even of those who stay at the border of the parade reading City of Gods, smiling, looking and chatting. Those who charge the MayDay to be "only a party" forget that one of the crucial aspect of a real party is the appropriation and the overturning of the space, in the "re-sacralization" of a domesticated, distant, "old" holiday like the one of the traditional First of May. Precarious workers celebrate, because in celebrating they recognize with each others, because that is the time of their taking word, leaving behind their shoulders the season of complaining bad luck, changing it in power. We do not "feel" precarious: we are precarious men and women, migrant and native, and we are the most angry. 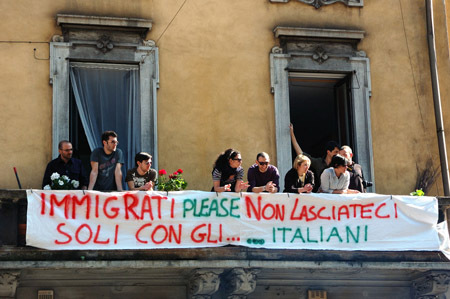 In the meanwhile, on a balcony, in Torino street, we see a banner: Migrants, we need you.don't let us alone with Italians! From the float, voices in the microphone answer: people from south America, Africa and Asia, who are tired to see their existence identified with labor, an existance that is a vital wealth for men and women but is not recognized, or it is regarded only as a problem from a left wing that has lost its identity while it was running behind the securitarian policies of the right parties. The best part of this country was in Milan, on May 1st 2008. To connect and unite with each others, demonstrators collect and put together the pieces of a precarious puzzle distributed from the floats. There have been even connection on the Radios: on the float of the precarious journalists of City of Gods, the Mayday demonstration in Aachen, where Sarkozy and Merkel are overcrowded with boo, is on air. 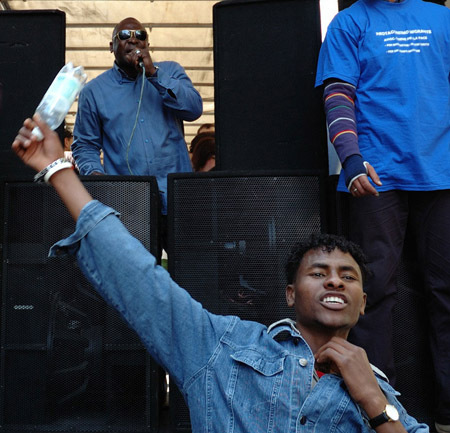 The message of the migrants demonstrating in San Francisco, addressed to the workers marching in Milan, is read from the floats. 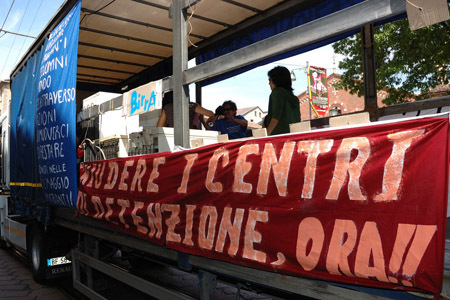 Connections have been realized with all the European EuroMayDay, from Lisbon to Maribor, with Pomigliano d'Arco, where people are fighting against the deportation of 316 percarious workers, with Rome, where migrants and precarious occupied the former offices of the newspaper "Messaggero". In order to declare that the season of bad luck is over, the water tatoo saying: "you will not have my skin!" is very stylish. This year, participation not only grew, but even involved new precarious subjects, and shew a more analytical and assertive attitude. De Corato, vice-major of Milan, on the pages of a newspaper declares: "notwithstanding the guarantees given by the organizers of the parade, the good guys of the no-global area and of the social center left their sign. A shame that will be punished, thanks to the surveillance cameras and to the collaboration of citizens". Like every year, De Corato & co. shout for the outrage, and the newspapers (good vassals) amplify. Of course, nobody writes anything about the reasons of the MayDay, about its contents, about thousands of men and women on the streets. According to the newspapers, May Day exists only by virtue of the writings on the walls. At least, some sharable messages will be on the newspapers: "just rentals", "right to housing", "more houses, less churches", "terrorist is he who evicts and exploits". Messages which are deeper and wiser than those on the advertisement posters which infest the city, a real outrage and example of urban vandalism. Our solidarity with the denounced demonstrators! We believe that the true vandalism is that of the Expo, as it was denunced on the float of the NoExpo Committees: a monster of precarization and destruction of the public spaces of Milan. Huge capital expenditure will become for us - the people of the underworld - precarious contracts, when we will be lucky. Otherwise, it will be the triumph of informal jobs, for those who will build up the exposition-window-city of 2015. Do not complain for the writings on the walls, you that are going to gash the soul of this city! In the middle of the deafening silence of a politics that remembers precarity only during the electoral campaign, the precarious workers of EuroMayDay008 say loudly that they can do by themselves. They have not only heart, ideas, creativity, communicative attitudes. They have even concrete proposals about income, welfare, housing, environment. While the left wing and the unions complaint, taking the distances from the real country, EuroMayDay is walking toward the future, in order to build up new precarious complicities. The march started. It will continue through the Long-lunga-larga-ancha EuroMayDay, which will make hear its voice in the next month.